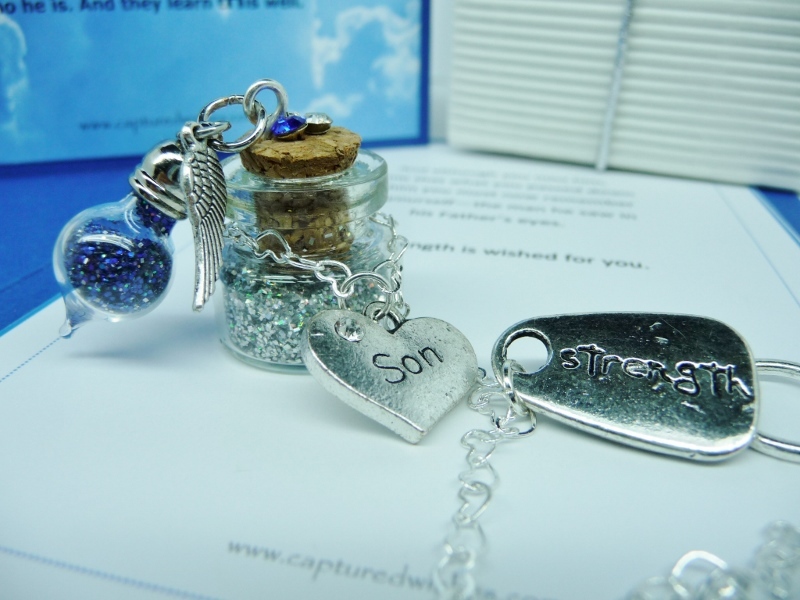 These personalized memorial gifts for a father's loss of a son offer a dad a touching keepsake to remember his beloved son. For most parents, a father's loss of a son can be an unimaginable event. Unfortunately, this is a sorrow that is faced by even those people we know or are close to. How do we manage to have the right words to say or or express from our hearts that we share in the burden of a lost son? It can be a struggle to show compassion and to comfort a parent, especially a Father's loss of a son. A symbolic wish of tears, like that which Captured Wishes offers, is a unique way to show compassion without having to dwell on what to say. A tiny tear-shaped glass vessel captures the emotions; the holographic glitter speaks volumes of the tears a father will shed in his grief. And to accompany the tear is another vessel filled with the wish of strength. It is a subtle but even-toned symbolism of strength to go on and to continue being the incredible man that bonded them together as Father and son. In a world of pain, there is hope their pain will heal. 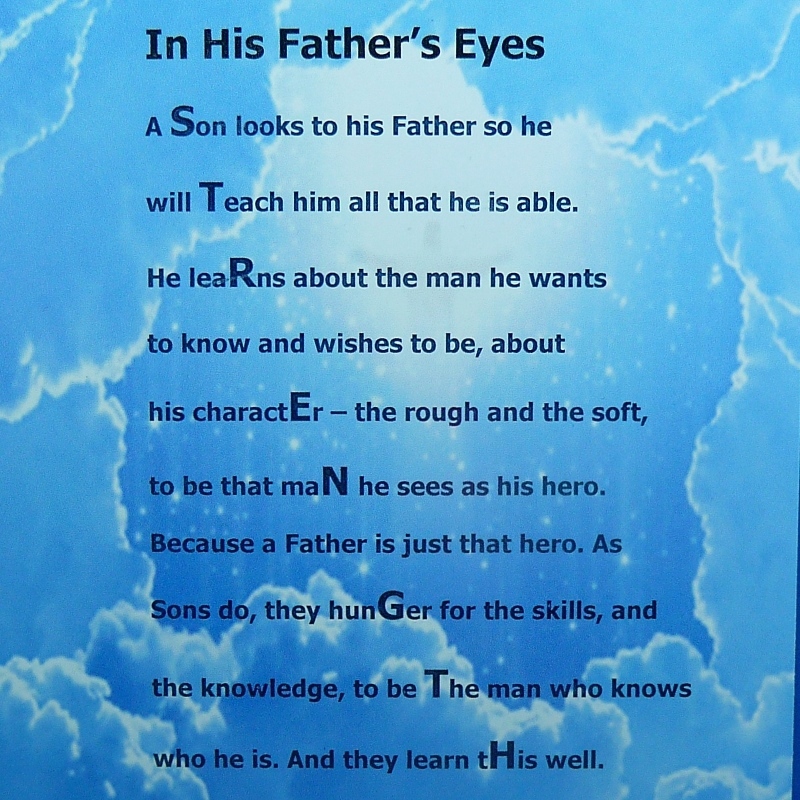 When you know a father who has lost their son, giving one of these personalized memorial gifts to him will reflect how much you share in the sorrow and that strength can be more powerful in the grief journey when it is acknowledged by others in its path. This wish of tears and strength can be personalized to contain the son's initial and is designed to stand alone or become part of healing encouragement if placed with other memories of a life left undone. Wish tear is (20x10mm) filled with heavenly blue holographic glitter as a representation of the tears shed in their loss. The larger vessel (25x20mm) holds the wish of strength, which is symbolized by silver holographic glitter, and is adorned by 3 rhinestones. Comes with a suction cup for hanging if desired. Can be placed as part of a shrine or area devoted to the deceased's life. The wish tear holds heavenly blue holographic glitter and measures 20x10mm. The larger vessel adorned with onyx and diamond rhinestones measures 25x20mm and it contains holographic glitter that is silver - silver being symbolic of strength. Not showy, these vessels are the best size. Reading the words of the verse card, the magnitude of the wish is realized quickly and seamlessly as a message from the heart.